Beginning in 2013, Gendai shifted their energy to a year-long program of focused research. Positioned as an alternative public research entity, their inquiry engaged with “a more radical version of a multicultural society through unpacking the problematic concept of the ‘model minority’ with artists, filmmakers, writers and activists, while also offering glimpses into histories of inspiring counter-models.”  The research carried out from 2013­–2014, conducted in the form of workshops, screenings, and art events hosted by like-minded institutions and collaborators, culminated in Model Minority. The “model minority” is an idealized subject and label usually attributed to an ethnic group and identified as such by the so-called majority of a society. The model minority is a notion that trivializes the differences among those it describes—typically casting them as hard-working, successful, diligent and agreeable—and sediments a racial hierarchy that subordinates those considered to have not achieved or to not adhere to its standards. The introduction also acknowledges that the “model minority” varies from context to context, but that in our North American context the term is “typically attributed to diasporic communities racialized as East Asian and South Asian,” which is the perspective reflected in this book. Most of the content is prefaced by a brief abstract, which is a dream for those who may utilize it to aid a research endeavor, while also allowing casual readers to locate themselves among the myriad of material. This ranges from excerpts of academic essays, stories, and general news media which have contributed to the establishment, deconstruction, or critique of model minority. To call Model Minority a book doesn’t seem totally sufficient. Gendai describes it as a “kit” and could be interpreted as a kind of textbook or tool to make connections between historical and contemporary minority politics. It may be fair to say that what begins like a textbook (official or academic language) gradually starts to resemble, through its elegant digression, an artist book (visual and narrative interrogation). A poignant aspect of this book’s design features smaller black and white inserts described as “counter models.” These are portraits of some overlooked groups and individuals that would “rupture model minority.” They are dispersed throughout the book, and are accompanied by a short but concise text that illuminates the figure among other social movements. Appropriately among them are filmmakers, writers and publishers. 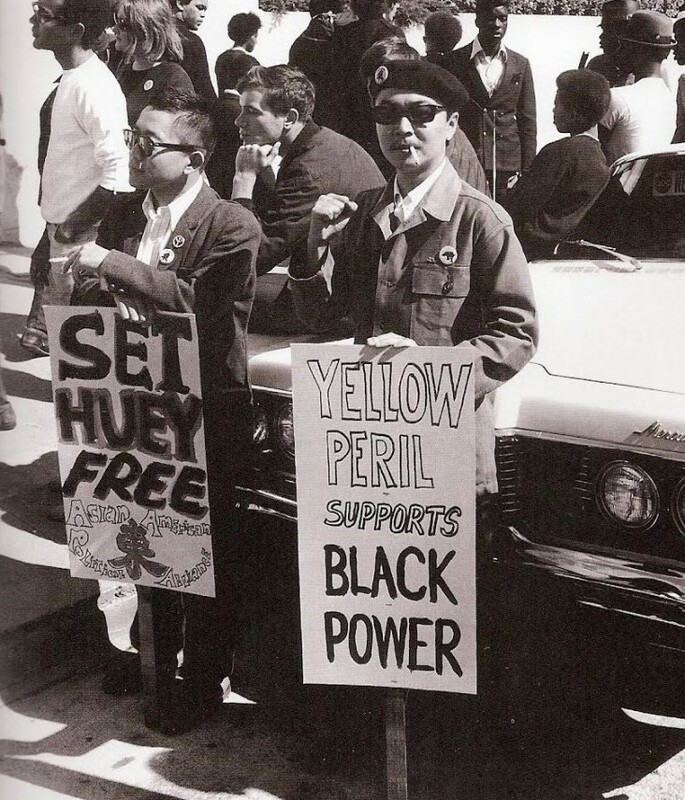 A particularly striking profile is of Richard Aoki who supplied armaments and training to Huey P. Newton and Bobby Seale of the Black Panther Party when they patrolled the Oakland police. This entry also highlights Aoki’s controversial history—allegations that he was an FBI informant. The possibility that Aoki may have been an informant is almost one of the most critical points raised within the text, as it severely complicates the notion of a model minority. These allegations suggest he was co-opted or subsumed back into the ideology he appeared to be dismantling. 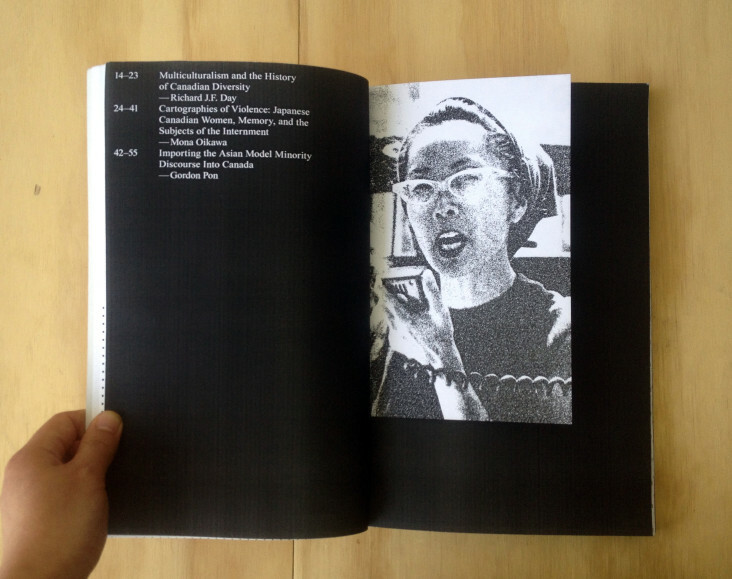 Other portraits, such as that of The Asianadian (1978­–1985), a countercultural press, and George Yamada, an American conscientious objector involved with the civil rights movement and aboriginal support chapters, serve to further illuminate other interracial solidarity histories. 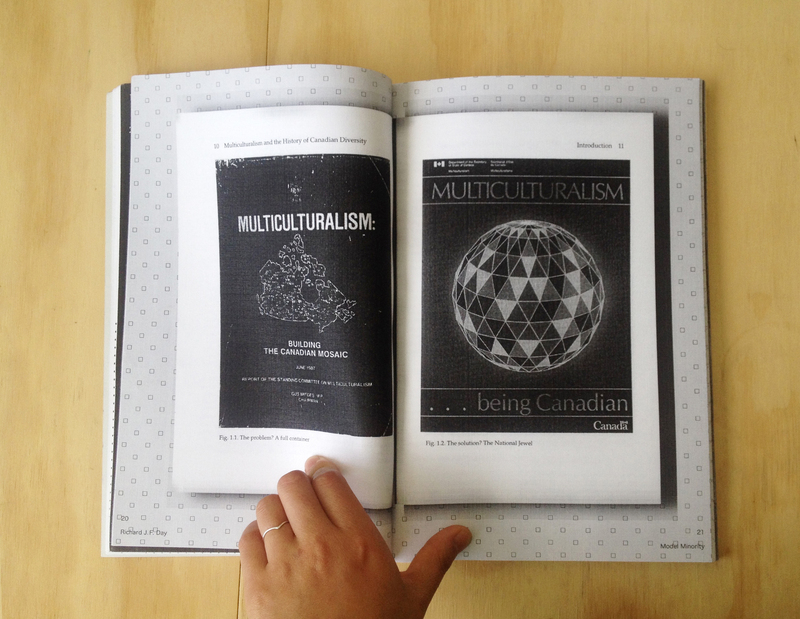 Many contributions attest to what co-editor Maiko Tanaka refers to as “…the function of the book as an assemblage of complicated stories of minority experience that don’t merely blindly celebrate diversity but [navigate] cultural and economic structures.”  On a local note, one of the texts commissioned by Gendai was written by artist Jinhan Ko, a member of Vancouver’s “service-oriented” art collective, Instant Coffee. 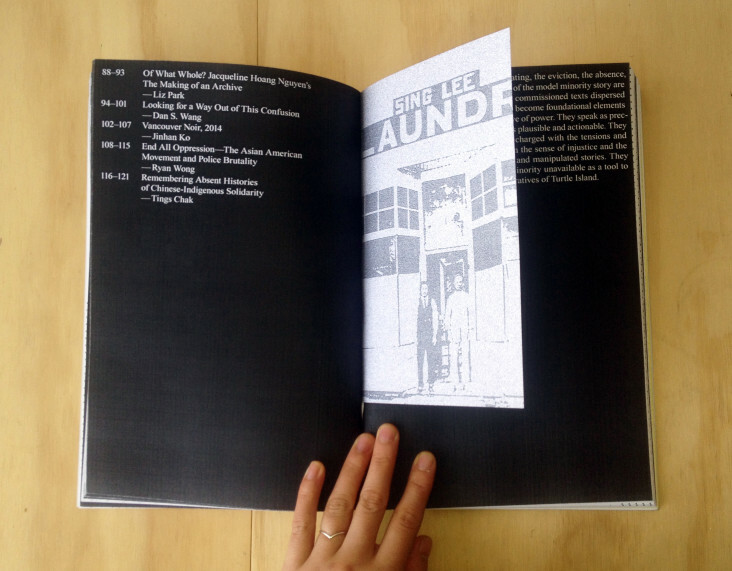 At the Vancouver launch of the project Ko performed a reading of the text, which deals with his collective’s eviction from their studio in the Ming Sun Benevolent Society building in 2013, along with low-income Chinese seniors who had resided there. Ko’s contribution is a narrative which starts with traces of optimism and ends with ambiguity, asking how the condemnation of the Ming Sun unraveled so neatly in a neighboring developer’s favor. Throughout the narrative, Ko recollects how the seniors attempted to organize self-patrol for the building at night or “work with the city” instead of invoking legal action. The initial outlook seemed to be that everything would probably work itself out, and the city would reject the absurdity of a perfunctory accusation: a few loose bricks certainly could not condemn a building and evict all its occupants. Currently none of the artists, or former residents of the now boarded up Ming Sun, are permitted to enter the building, though their possessions remain inside. The book also includes archived media cited for “paving the genealogy of model minority” by general news outlets such as New York Times Magazine and The Globe and Mail. Transcription and screen captures from a CBC news story called “Entering the Professions” (1957) profiled Asian-Canadians that were considered successful examples of multiculturalism, featuring one of Vancouver’s former MP’s Douglas Jung. The segment’s narration reads, “Although Mr. Jung, is the first of his racial origin to become a member of the House of Commons, he’s certainly not the only successfully blend of the orient and the occident here in British Columbia. There are a great many”—one of a many troubling, creepy even, excerpts from the official channels of burgeoning post-war multiculturalism with a neoliberal subtext. Gendai acknowledges the limits of the publication’s content, very much framed as an inquiry in its infancy. The contents of Model Minority present a history, but one that is able to connect with recent events. Texts that are exemplary of the book’s social justice network include a transcribed speech given by No One is Illegal Montreal representative Vincent Tao last year at a solidarity rally denouncing police brutality on student protesters in Hong Kong, and the contribution by No One is Illegal Toronto organizer and artist Tings Chak’s, which is a written account of oral histories between early Chinese migrants and Indigenous peoples in British Columbia. The latter is one of several history lessons in this book that most Asian Canadians will not have, unless they specifically seek it out. Now, they’ll have an easier time finding it. The book is evidence of a concerted effort by artists to scrutinize the genesis of a passive coexistence, and the facile optimism of “model minority.” It is a book that has and hopefully continues to synthesize a spectrum of cultural workers and activists. Still, “book” doesn’t quite cut it for me. Model Minority is available in Vancouver through Publication Studio Vancouver, online, or free reading commons. Gendai was founded as a not-for-profit public art gallery in 2000 to promote excellence in contemporary art and design with an emphasis on work made by Canadian and international artists of Japanese ancestry (and beyond that, by the broader East Asian community.) In 2009 the mandate of Gendai was shifted to cultivate dialogue through contemporary art, focusing on experimental collaborations with contemporary artists and organizations for the production and dissemination of artwork from East Asian perspectives. They are currently working programming another long-term series called “Gendai Kitchen” in support of provisional spaces for making food, art and conversation with different communities. Working with artists who are also amateur chefs in their private lives, the project explores the familiar exchange of food to engage with cultural difference and politics of eating that are otherwise flattened and marketized in the current “Foodie” context of Toronto. Email correspondence with editor, Maiko Tanaka, May 28, 2015. I had surmised that it may have been the result of another kind of diaspora in the Canadian non-profit arts sector, but it was the reality of taking on the expenses of a physical space, where they were formerly operating out of the Japanese Canadian Cultural Centre, in combination with the precarity of chasing arts government funding for operations. 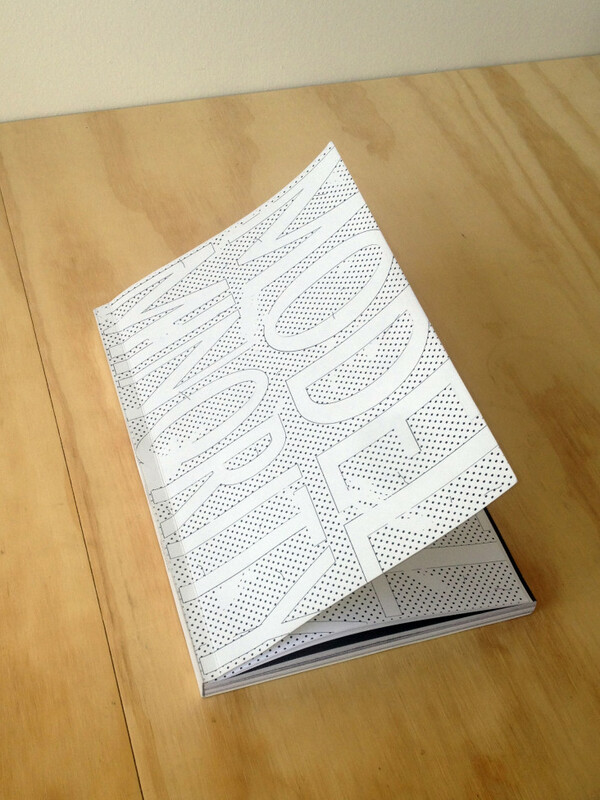 Link to Model Minority’s official website which details their pre-publication programming. This was brought to my attention by Bopha Chhay. Email correspondence, May 28, 2015. Posted in Art & Culture, Book Review, History, Immigration. Bookmark the permalink.